The topic tonight, is jello. If you have been reading or following me on FB awhile you know how I feel about jello. It is not my favorite and by that, I don't mean taste, I mean texture. I won't get into my comparisons here but, it takes me a good bit of "talking myself through" to eat jello! However, I was watching one of my favorite YouTube channels, and could not resist sharing this with you. 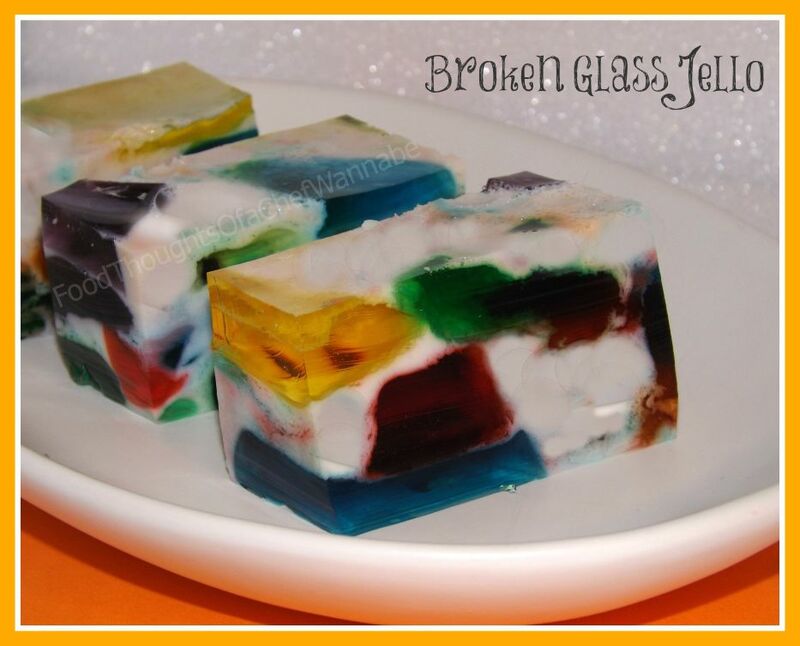 Check out the video here, Yoyomax12-Rainbow Broken Glass Jello. I adore this channel, Tammy makes the most FUN stuff ever! Check her out! Like I said, since I also enjoy "fun" food, I had to share this with you all. So I went and bought my 6 colors of jello, and while I was doing it found some awesome flavors. Great alternatives for the old regulars, of lemon, orange, strawberry, etc. I think I used Island Pineapple, Raspberry, and Peach instead. Just a few examples, but when you don't eat jello on the regular, it is amazing all the cool new (to me) flavors they have!! Just get your 6, all colors of the rainbow! I used Blue....somethingberry and grape, lime, and those above. Fun stuff! Now where I grew up, jello is part of a meal. Just as you have meat, potatoes, veggies, etc, you also have jello. When I moved to the east coast, I would see "jello" listed as a dessert. I was like, "whaaaaa"? My husband (boyfriend at the time) informed me, it WAS dessert. I checked him, before I wrecked him, "Um, NO, jello is part of dinner, not dessert, dinner". Well, needless to say, different strokes for different folks. I had made a jello salad for a family meal as an experiment, and I put it on the table during dinner, so I could sit back and observe. Sure enough, nobody touched it...UNTIL I had cleared dinner from the table. Strange. Anyway, this is a alot of gelatinous fun in one pan. Jiggle it, wiggle it, or slurp it down. Just enjoy it! Use 6 bowls, of about the same size. I used square Rubbermaid bowls. You need one bowl for each color. Put one box of jello per bowl. Now, add 1 cup boiling water to each bowl, one at a time, mix thoroughly until the jello is dissolved. Remember just ONE cup, do not follow the pkg instructions, as it will call for 2 cups of water. When you have mix them all put into the refrigerator to set. This will take a bit, so be patient. When the jello is set, cut it into cubes, in the bowl or you can flop it out and cut into cubes. Do this with all of them and then put into a 9x13 pan. Just mix up the colors so there is a little bit of everything, everywhere. Just try to make it sort of evenly distributed. Now, in a medium size bowl or large (4 cup) measuring cup add in both packets of unflavored gelatin, 2 cups of boiling water and sweetened condensed milk. Mix until gelatin is dissolved and condensed milk is combine with the water and.....STOP!!! Here is where I went a little wrong and got some blurring of colors so to speak in mine. LET IT COOL a few minutes before pouring over the jello cubes. Pour over and put into the fridge to set. There you have it. As I was just starting to pour the condensed milk mixture over my jello cubes in my head I was thinking, "self, this is gonna melt the jello and the colors are going to run everywhere". What I didn't tell myself was to STOP POURING. My husband said, "Chris, it shows in BIG WHITE LETTERS right on the video to let it cool". Sorry Tammy. Missed that boat for sure. It won't affect your flavor or texture or anything, just the "pretty" factor. I still think it is pretty and it is really good! On that note, I hope you enjoy this fun dish/dessert, whatever you do with it! !